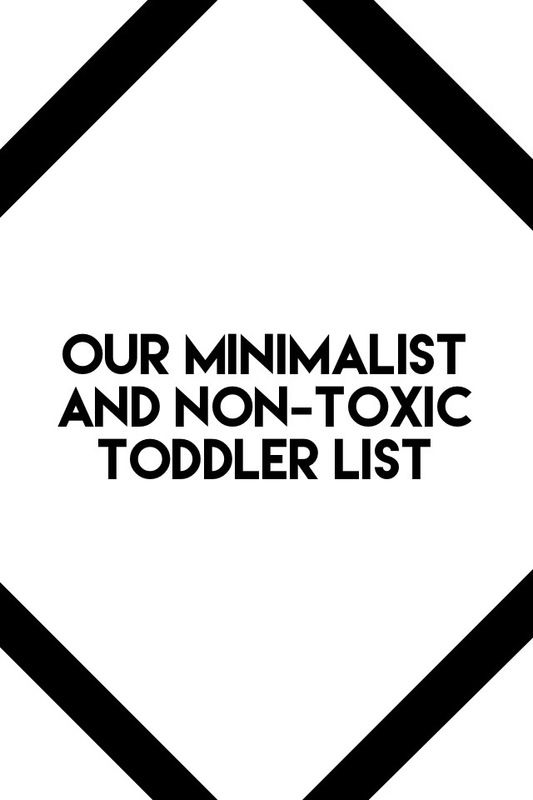 Having a minimalist toddler is a lot more difficult than a minimalist baby. Toddlers want things beyond a full belly, a clean diaper, and a warm place to sleep. Toddlers are exploring, learning, and destroying machines! They have opinions on what they wear and eat and play with. 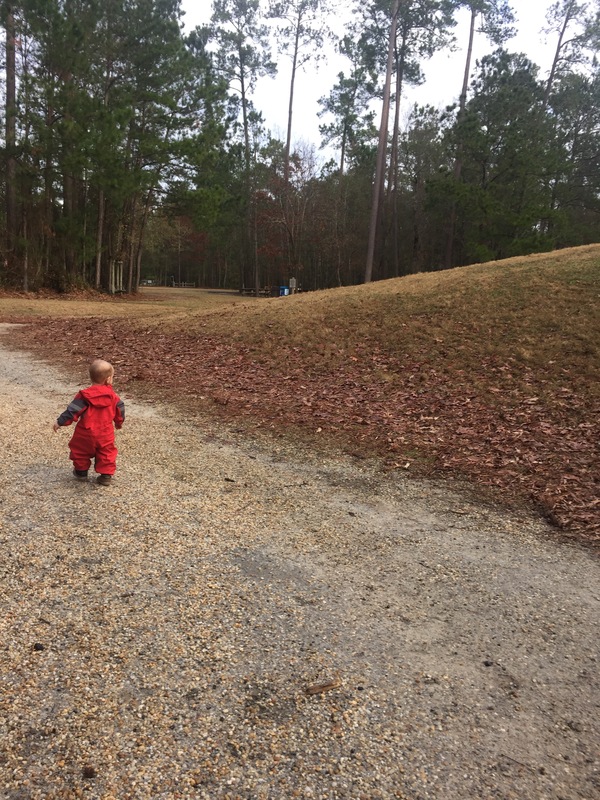 I can only tell you how we’ve approached living minimally with a toddler, because every toddler is different. I hope that it will still be helpful for you. Eating: Eating changes a lot when solid foods enter the picture, especially if you do Baby Led Weaning (BLW – aka feeding your kid the same stuff you are eating). Suddenly, Kai needed a place for her food, and utensils that fit her hands. 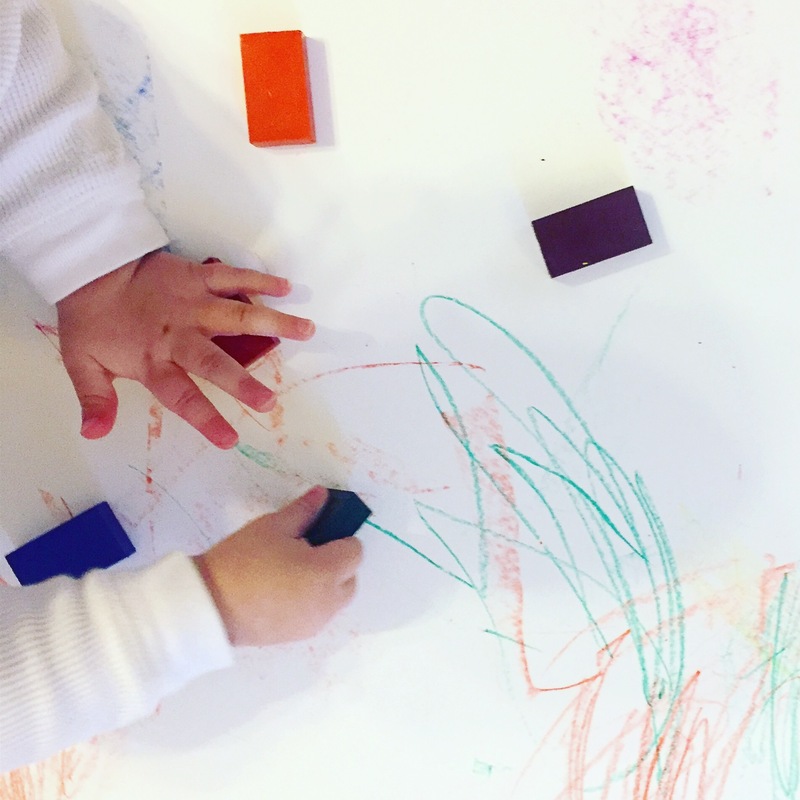 We take a page from Montessori philosophy here, and use real table settings. Kai uses a dessert plate from the same set as our entree plates, so no new purchases there. She started drinking out of a shot glass, and now uses a small glass cup that we already owned. We did buy her two sets of silverware as her tools need to fit her hands. We got ours at World Market from the loose silverware collection. She sits at the table with us in her Keekaroo Height Right Highchair , which is serviceable. I would’ve held out for a used Stokke Tripp Trapp if I knew then what I know now. The plastic foam infant seat on the Keekaroo is too much plastic and doesn’t give Kai a firm enough connection to the seat. Otherwise, I really like that she sits at the table with us, and that it easily wipes clean. She still drinks out of a Pura Kiki With Silicone Straw on the go, and I still love them. No plastic and pretty close to unbreakable, we have four which is about right for us. If my husband would stop losing the straws, they would be perfect (you can buy replacement straws/tops or jury rig something pretty easily.) I pack her snacks in these Kids Konserve Nesting Trio Stainless Steel Containers or in homemade waxed cotton cloth. Potty Learning: We are only just taking the first steps here. Kai still uses her cloth diapers full time, but she has a Bjorn Smart Potty Chair that we got for her baby shower. We have it set up in the bathroom so she can choose to use it when she wants. There are more Eco-friendly options here, and when we move to a reducer seat, we’ll be using a bamboo one in conjunction with a bamboo step. We have Sloomb cloth training pants waiting for her to be ready, but since we haven’t used them, I can’t tell you how they work yet. Carrying: Our Girasol Wompat is our go to carrier these days. It’s a Meh Dai with wrap style straps, which means it wraps a little faster than a wrap, but still feels pretty wrap like. Kai is rarely patient enough for a wrap these days (sadness) but the Wompat is supportive and cuddly and I’m really happy with it. Car seat: She is still rear facing in her Clek Foonf and we are both still really happy with the choice. The Foonf is solid and super safe feeling, and isn’t busy or babyish looking like many car seats. She has a special car seat stuffed animal in each car (because we kept leaving them in the wrong car and she kept freaking out.) Other than that, we don’t have any other car entertainment unless it’s going to be a long drive. Clothing: It’s a struggle to keep clothing minimal because clothing is one of the two things people really want to give you (the other being toys). If you hang around the blog or over on Instagram, you’ve got a pretty good idea about how much I love wool. We do woolies for bottoms 80% of the time. Kai also has a pair of jeans and a pair of khaki work pants that were gifts and are adorable. I try and keep her at or under ten pairs of pants at any one time, but Christmas made that hard. For tops, I’d love to keep those to ten as well, but they are actually even harder to keep under control than pants. Since she’s about to move up a size and we’re headed into what will certainly be a blazing hot summer, I’m consider sewing her ten tops out of linen that I have laying around. In an ideal world, we’d have seven tops, seven bottoms, three dresses, two sweaters, two wool baselayer sets, and a million socks (okay, maybe not a million, but those things disappear like they come equipped with a vanishing charm!) That’s what I’m aiming for in 3T, the next size we need to assemble a wardrobe for. She also has two pairs of shoes and a swimsuit. Rainsuit/Snow gear: We are committed to spending 300 days outside this year (#300daysofwild) and so Kai needs clothes appropriate for the weather. She has an Oakiwear rainsuit that we will add extra insulation under for snow (when we go and visit snow, because it’s not coming here). There’s a full review coming this week. She also has a warm coat that came to us via Grandma’s garage saleing for times when she won’t be getting wet, but it’s still cold. Toys: Toys are the hardest category to keep minimalist. Everyone wants to buy your kid toys, and at least for me, I want to buy her toys, too. Lots of toys appeal to me, and if I wasn’t keeping minimalism in mind, we might be buried in a myriad of beautiful wooden and handcrafted toys. Christmas pushed us over the top, and it’s time to reassess what we are keeping and what should go. My ideal toy collection for a toddler would be two dolls, two stuffed animals, a varied collection of blocks, six wooden animals, four or so balls made of various materials, three or four playsilks, four play clips/clothes pins, a collection of natural materials (sticks, rocks, pinecones, etc), three bowls or boxes and art supplies. It may not be truly minimalist, but we do toy rotation because it’s like getting new toys every month and I think that lessens the I-Wants. We also try to keep only a few toys available to Kai at a time, so she can focus on play, and not get overwhelmed by stuff. Doll/Stuffed Animal: Those of you who follow me on Instagram are probably familiar with Max the Raccoon. He’s Kai’s second Max (Max I died tragically via dog) and he’s her bff. She received a fox named Reggie from the same company, Hazel Village, for Christmas. 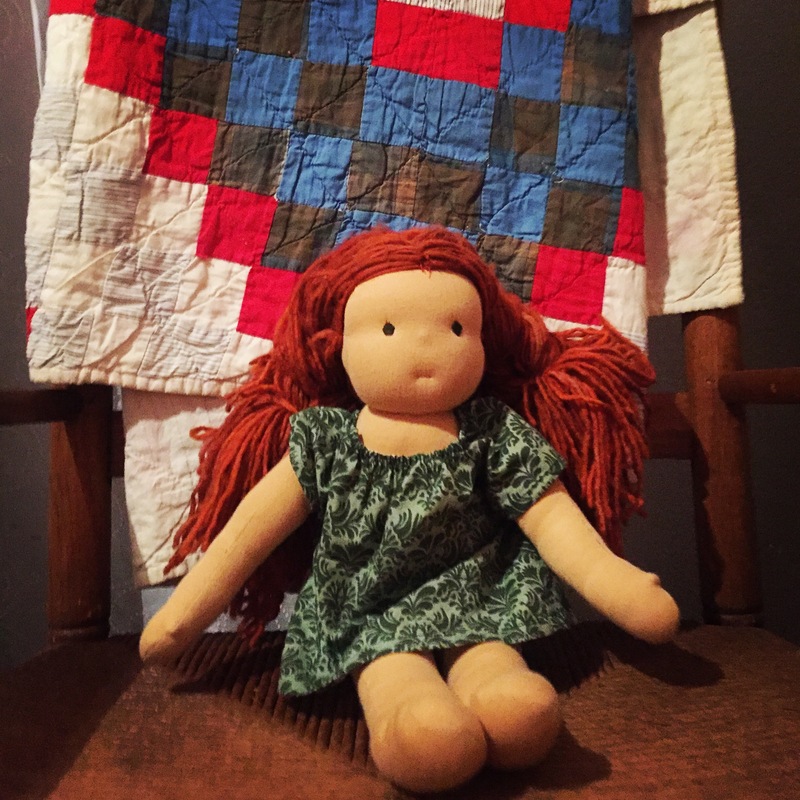 You might have also seen her mama made dolly, Andromeda. These are the core of her stuffed thing collection. Max and Reggie are special carseat animals, and Andy goes everywhere with her. She has a few other stuffed animals and dolls, mostly mine and my husband’s childhood toys. I leave one large and two smaller stuffed animals our dolls out at a time. I also make it a policy of disappearing stuffed animals that aren’t going to stay and quickly. She seems to get attached to these furry friends very quickly, and I don’t want to her to buried in them. Wooden Animals: This is my weakness, I love wooden animals. She has a dozen, which seems like a good number. Enough to play farm, but not so many that they are always underfoot. I just have to keep reminding myself of that. She also has five stuffed animal finger puppets. I switch out the wood animals and the finger puppets when we rotate. Blocks: We have a set of unit blocks, a set of Twig Blocks (they looks so cool, but I don’t recommend them unless you want to sand and repaint them yourself), and set of hollow blocks filled with things to make various noises. I try to only keep one set or a selected subset of block out per rotation. Balls: We have a set of 2” wooden balls, a larger (~5”) rubber ball, as well as a wool stuffed cotton corduroy ball of the same size, a miniature soccer ball, and a kick ball. Loose Parts: The idea of loose parts is one of my favorite parts of the Reggio Emilia philosophy. You can use almost anything as loose parts, but my Arts and Crafts influence pushes me towards natural materials. We have sticks, river rocks, pine cones, tree blocks with and without holes in them, small wood pine trees, small wooden bowls, wool i-chord, and a few precious stones. These get rotated a lot. Playsilks: We have six 8×8” rainbow colored silks, and two larger 35×35” silks. We also have two pieces of cheesecloth that were from a friend’s newborn photo shoot. I plan on adding four playclips to our collection to make it easier to turn our playsilks into forts and dens. We have a few other things that came as gifts and are probably going to the donation bin when they are rotated out. Aden and Anais blankets: These are still used every day in my house. I throw them over Kai when we are running into a store in the rain or if it’s chilly, she uses them as loveys and cuddles with them, they wipe noses and spills, and are basically just an all around workhorse. Sakura Bloom Ring Sling: We use this for quick ups, which, now that Kai can and insists on walking, is how most ups go. Someday I’m going to have to stop carrying this kid around and that makes me so very sad. Cloth Diapers/Wipes/Wetbags: Someday Kai will decide to potty train, until then, diapers. Toddler backpack/nature walk bag: I’m going to do a full post on this, but Kai loves her backpack. Okkatot Traveler Diaper Backpack: We take so much less stuff when we go out these days. We still use it for long trips, but for anything short, diaper, wipes and a change of clothes get thrown in a wetbag. Okay, so that was exhausting. 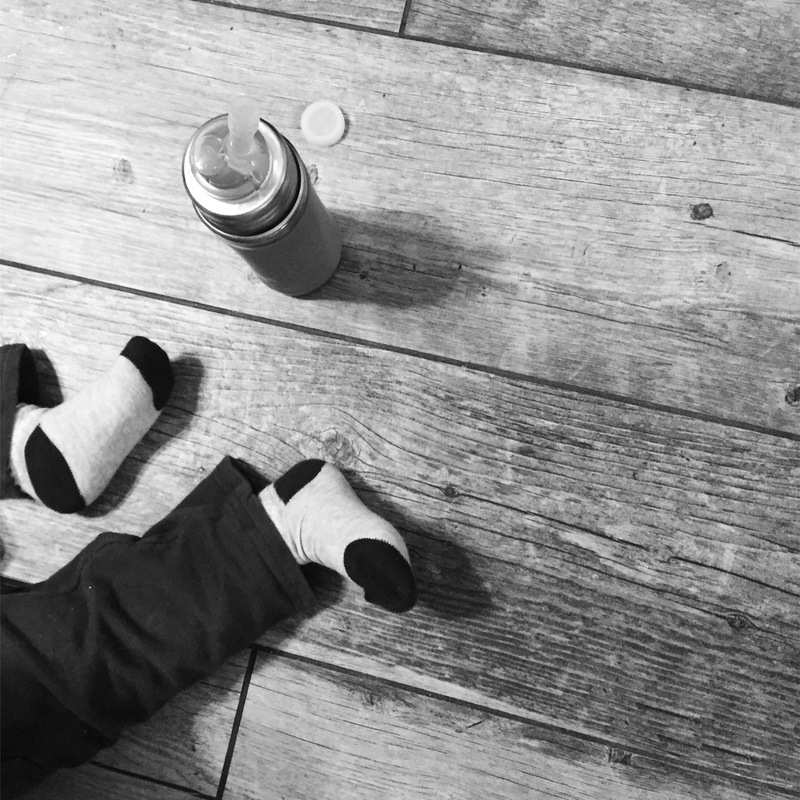 If you’ve got any great ideas on decluttering even more or you want to let me know what your toddler absolutely cannot live without, please talk to me in the comments! We like a lot of the same things 🙂 My son is getting heavier and harder to wrap when he is grumpy so I have been trying to figure out which kind of carrier to try. I’ll have to check out the wompat. Grumpy is the worst! I hate when she decides to be uncooperative halfway into a hike, but doesn’t want to walk back either.